Polenta is usually made from yellow cornmeal, although white cornmeal can also be used. It originated in Northern Italy as a peasant food. Today, polenta is enjoyed all over the world and can be found precooked in stores, making it a quick and convenient food to consume. Freshly made polenta has the consistency of grits but can be made into cakes for grilling or frying. Because it is made from corn, polenta is also gluten-free. To make polenta at home, you will need 6 cups of cold water, 1 1/3 cups of cornmeal and 1 teaspoon of salt. These ingredients are combined then cooked for 45 minutes to one hour. 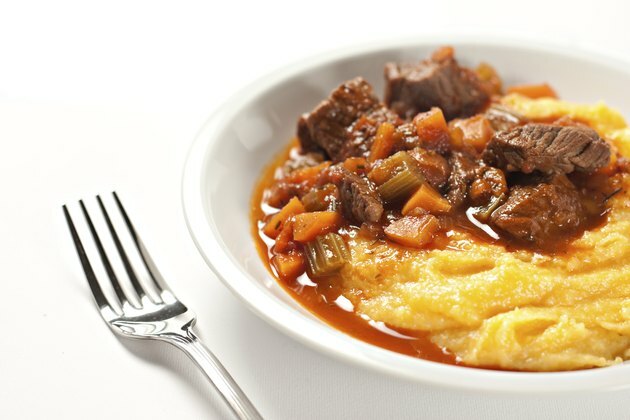 Using this recipe, homemade polenta contains 73 calories per 1/2-cup serving. The calories from polenta are mostly from its carbohydrate content. One serving contains 16 grams of carbohydrates, including 1.5 grams of dietary fiber. Homemade polenta also contains less than 1 gram of fat and almost 2 grams of protein. While polenta contains numerous vitamins and minerals, it is not classified as a good source for any of them, reports the U.S. Department of Agriculture National Nutrient Database for Standard Reference. Polenta contains traces of the minerals calcium, iron, magnesium, phosphorus, sodium and zinc. The vitamins found in polenta in small amounts are: B vitamins, vitamin A and vitamin E.
Polenta from the store is precooked, so all you have to do is heat it up and serve, making it much more convenient. Store-bought precooked polenta is usually found in the shape of a tube and wrapped in plastic, similar to cookies found in the refrigerated section that you cut and bake. In this form, polenta can be cut easily and stays together when heated. When referring to the ingredient list, you will find that store-bought polenta contains water, yellow cornmeal, salt, tartaric acid (additive), ascorbic acid (vitamin C) and beta-carotene (vitamin A). Due to the addition of ascorbic acid and beta carotene, store-bought polenta is a bit higher in vitamin C and A than the homemade version, but calories, fat, carbohydrates and protein are similar. One way to enjoy homemade polenta is as a side in place of bread or pasta. Similar to grits, you can add cheese, pepper or butter for additional flavor. Polenta can be found in several recipes including soups, desserts, breakfast entrees, casseroles and sauces. Store-bought polenta can be broiled, deep-fried, microwaved or pan-fried. For those following a gluten-free diet, polenta works as a gluten-free grain substitute.